Columbines have long been prized for their elegant flower form—so we're especially excited about Kirigami, which shows off all this beauty better than ever before. 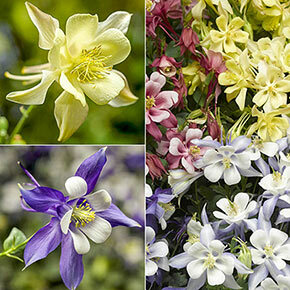 These blooms have a bigger canvas to work with—they are nearly twice the size of those on the average columbine cultivar. Normally, columbines have nodding heads, so you can't see the intricacy of their blooms without lifting them, but these face upward so you can see the beautiful bicolor petals. Their habit is uniform, and foliage stays lovely through the season. The long, elegant spurs look like some artistic flourish, but actually contain nectar that hummingbirds and other beneficial pollinators adore. Flower Form: Upward facing 3" blooms. Pruning: Remove spent flower stems if you don't want to find seedlings next year.